KATHMANDU, Aug 22: When Kamal Thapa, 36, started driving a public bus in the ring road route seven months ago, the most frustrating thing he encountered was the three hours long traffic jam in Kalanki. Construction works for road widening was ongoing then and the vehicles had to be run in a narrow side lane. Even after the completion of the construction work, Thapa recounts that the traffic jam would last more than an hour. The only reason for the jam was an incomplete 800 meters long underpass between Khasi Bazaar and Bafal Chowk of Kalanki. The commuters on the road section too were relieved when they came to know about the operation of the underpass. Before the underpass was opened, Arakshan Rijal, 23, of Balkhu would have to leave earlier than necessary for work keeping the time consuming jam in mind but still used to reach his office at Dhungedhara late at times. Khatiwada added that traffic jam in Kalanki now lasts for a maximum of two minutes. However, Khatiwada claimed that the dust and smoke in the area has increased with the opening of the underpass since it is still incomplete. Dividers, traffic signs, lighting and another layer of asphalt are yet to be added to the four-lane underpass. Khatiwada is optimistic that all the works will be fixed within two months. 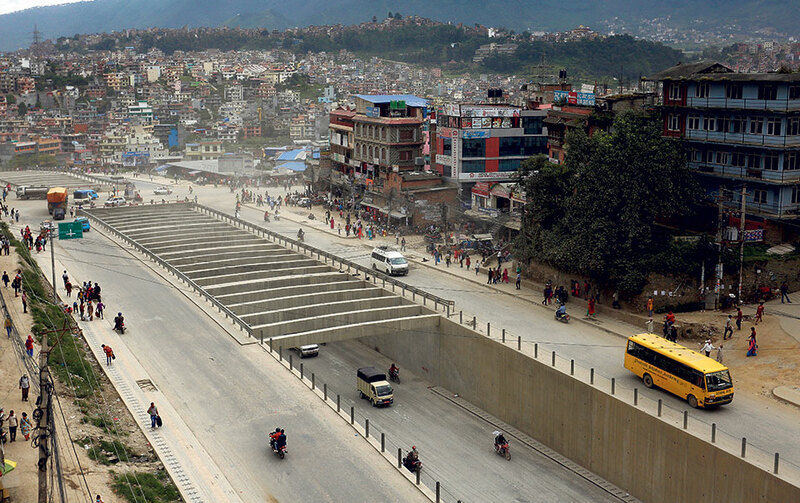 The underpass is a part of the 10.5 kilometers long Kalanki-Kathmandu road expansion project which started in 2013 with a Chinese grant of Rs 5.13 billion. The construction works for the underpass was previously hindered by the 2015 mega earthquake and India’s trade embargo on Nepal.